Broadway’s hit crowd-pleaser takes you to the Bronx in the 1960s, where a young man is caught between the father he loves and the mob boss he’d love to be. 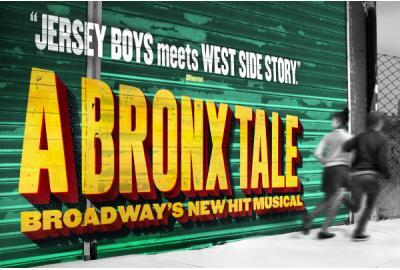 Bursting with high, energy dance numbers and original doo-wop tunes from Alan Menken (Beauty and the Beast), A BRONX TALE is an unforgettable story of loyalty and family. Academy Award® winner Robert De Niro and Tony® winner Jerry Zaks direct this streetwise musical, based on Academy Award nominee Chazz Palminteri’s story, that The New York Times hailed as “A Critics’ Pick! The kind of tale that makes you laugh and cry.” Recommended for ages 12+ due to strong language & gun shot effects.